Just how does the +48V get to power the mic circuit AND carry audio signals at the same time? You would not measure any voltage between pins 2 and 3 on the XLR (canon) connector but from pin 2 to ground you will measure +48V and also from pin 3 to ground you will measure +48V. 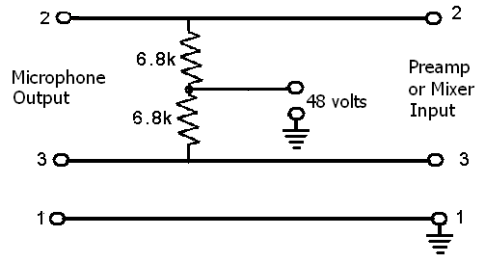 The 6.8k ohm of resistance allows the audio signal to ‘float’ on the rails as the audio voltage is developed across that resistance. Remember the audio level is in mV.